We recently updated the design of 1) our pricing page and 2) the hardware selection page in order to offer more visibility on pricing, as well as to create a smoother user experience when users are setting up jobs. 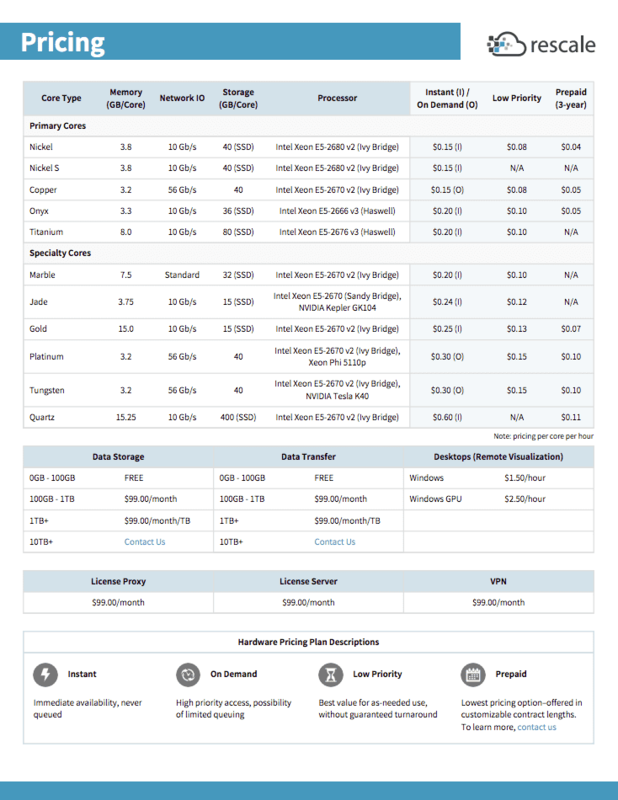 Our pricing page now includes a detailed, dynamic chart where you can filter for hardware specs and pricing. For example, if you wanted to compare Prepaid pricing and Instant/On-Demand pricing for Windows while referencing Memory and Processor info for the cores, you can select only those four columns in the filter and toggle between Linux and Windows options on the top right. You can also download the chart as a PDF directly onto our Rescale template to use as a hard-copy handout or to email to colleagues. To access the pricing page: Log into your account, click the dropdown at your email address at the very top right corner, click Account, and then click Pricing on the left sidebar. The hardware selection page, which you will encounter when setting up a job, has undergone a minor restructuring, along with added pricing options. We moved the hardware summary to the side navigation as a fixed element so you can keep track of your settings throughout the job setup process and so that it doesn’t get hidden on smaller screens. You can also easily compare Prepaid, Instant/On-Demand, and Low Priority pricing and availability side by side while setting up your job. Below the hardware selection chart, we changed the core number sliders (and for DOE jobs, the task slot sliders as well) into a simple number entry field to be more streamlined and to better accommodate large numbers of cores. Just type in the number of cores you want or use the + – button to view the next appropriate number of cores above or below the number you input. For example, if you entered 5 cores but the core type you selected only offers 4 or 8, then the + and – button will automatically skip to the next suitable number of cores. At Rescale, we follow a users first approach to our product and design, not just by incorporating data from user-focused research, but by leveraging feedback from existing team activities as well. Compiling information from many channels gives us a holistic and many-angled view on our users’ behavior and needs. User feedback through support channels: Our support team goes over user issues with our whole dev and design team on a weekly basis. Sales and marketing bringing back info from talking to customers and prospective customers on their needs and workflows. User testing and customer product surveys to pinpoint user challenges and keep up-to-date on customer satisfaction. Stay tuned for more improvements, or send your feedback to us at info@rescale.com.